This is the time of year when everyone needs a recipe for easy gingerbread in their back pocket, because Christmas = Gingerbread. And while I am always so impressed by everyone who has the talent and patience to make gingerbread men and gingerbread houses, in my kitchen the gingerbread comes in the old-fashioned classic form. Soft, warm, dusted with powdered sugar and ready in a jiffy for when you need just one more dessert. And at this time of year, who doesn’t need one more dessert? Let’s make gingerbread! For me, gingerbread also has one additional sweet advantage, and that is that it will always and forever remind me of my dad. He wasn’t so much a chocolate dessert lover, but if you said gingerbread his eyes lit up. And so every now and then I would try and make a gingerbread something or other just for him. You could also totally rely on him to rock a Peanuts tie on Christmas. Just one of a million things that showed his merry outlook on life on Christmas Day and always. 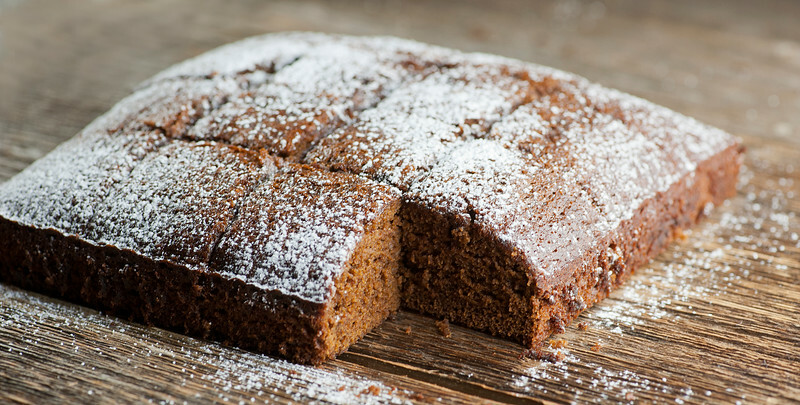 Meantime, this easy and classic gingerbread recipe is a quick mixture of flour and spices combined with molasses, butter, sugar, egg and a few other things that I’m sure you already have in your pantry right this minute. 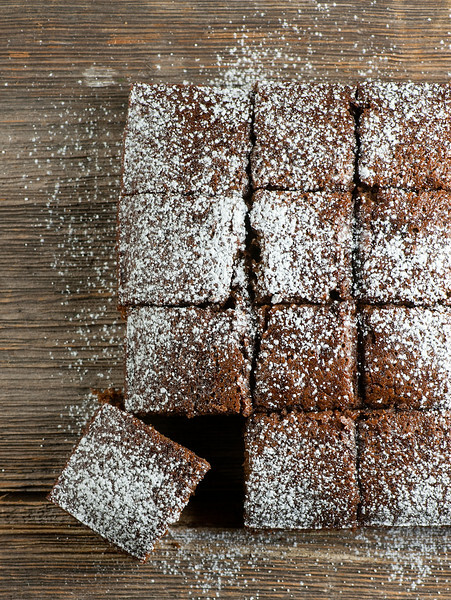 Pour the spicy and sweet batter into a square baking pan and about 40 minutes later you will have a lovely, aromatic gingerbread, all ready to be dusted with powdered sugar. And with that, I want to wish you and your family a peaceful, merry holiday. I’ll be back again after Christmas…until then, love and gingerbread from me to you! Line a 9 inch square baking dish with parchment paper and preheat the oven to 350. Combine flour, spices and baking soda in a mixing bowl and stir until combined. Take a second larger mixing bowl and combine molasses, sugar, butter and hot water. Stir until butter is melted. Whisk in egg until combined. Add flour mixture to molasses mixture and stir until just combined. Scrape batter into pan. Bake until a toothpick inserted in center comes out clean, about 40 minutes. Cool, then cut into squares. Dust with powdered sugar and serve! Do you think I would need to double the recipe for a Bundt pan? I have a fun Christmas tree one that I’ve yet to use this year and gingerbread would be perfect for it. Oh my goodness. I *think* that would be okay – it’s really just a basic spice cake recipe. It does rise a bit, so I would only use as much of the doubled recipe batter as you can fit into the pan with some room to spare. Fingers crossed! What a great recipe Kate and I bet it makes the house smell warm and lovely. I have been thinking of you a lot and I wish you a Christmas with the closeness and love of your family. You are right, everyone gets so caught up with gingerbread houses and gingerbread cookies, that the good old gingerbread gets forgotten about! I love classic gingerbread, yours looks amazing! Merry Christmas to you and your family! Merry Christmas to you too, Melanie! Mmm I’ve never made gingerbread before, only various forms of it through cookies, fudge, etc. This looks perfect, Kate! I hope you enjoy your holidays! This gingerbread sounds delightful! I love all the warm spices in here. I’ll bet is smells delicious when baking! I love that your dad loved this! And the Peanuts tie–my dad rocks a Mickey Mouse one to weddings, and it’s a point of nostalgia for me as well. I’m saving this one–happy holidays, Kate! Hi Ala! 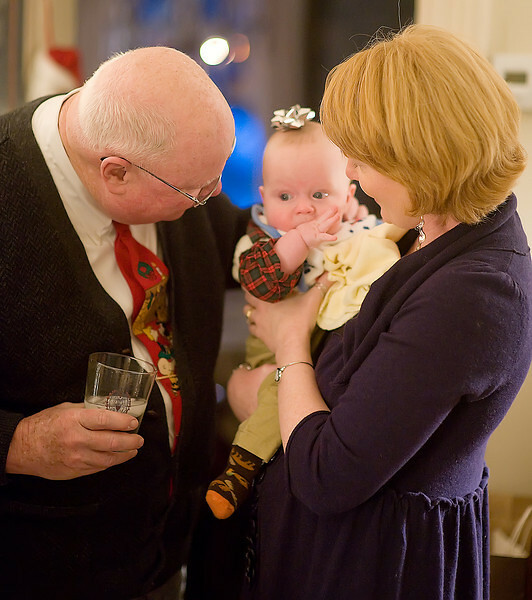 Love the thought of your dad and his Mickey tie – it’s these precious things that memories are made of. Hope you have a wonderful new year! This looks delicious! Merry Christmas & Happy Holidays! Thanks Manali, and happy merry everything to you! I haven’t made gingerbread in cake form. Can’t way to try this! Oh, it’s so warm and wonderful – hope you love it as much as we do!